We occasionally republish articles from our archives, that some may not have seen. We ask our long-established readers to bear with us on this. We will continue to put out our stream of current articles. Our site stats have shown that our readership has been particularly interested in perspectives of Latics players from fans of their previous clubs. Thanks to contributions made by bloggers on the fan sites of those clubs for these articles. No sooner had Jake Buxton signed for Wigan Athletic but he made his debut last night at Oldham. The 31 year old central defender, who is 5 ft 11in tall, has joined Latics on a three year contract. Jake Buxton was born in Sutton-in-Ashfield, a Nottinghamshire market town. He started his career four miles away in Mansfield coming through the youth ranks, making his first team debut as a 17 year old in a Football League Trophy game against Crewe in October 2002. Buxton was to made captain at the age of 21 in the 2006-07 season and was to spend 6 years at Mansfield Town, making over 160 appearances. However, on the club’s relegation to the Football Conference in 2008 he left by mutual consent. Following a trail at Crewe, Buxton joined Burton Albion and they went on to win the Football Conference title under Nigel Clough. Buxton was voted Player of the Year for the Brewers in that 2008-09 season, after making 40 appearances. Clough was to join Derby County the following season, taking the out-of-contract Buxton with him. Buxton went on to make 139 appearances over 7 seasons for the Rams, scoring 11 goals. 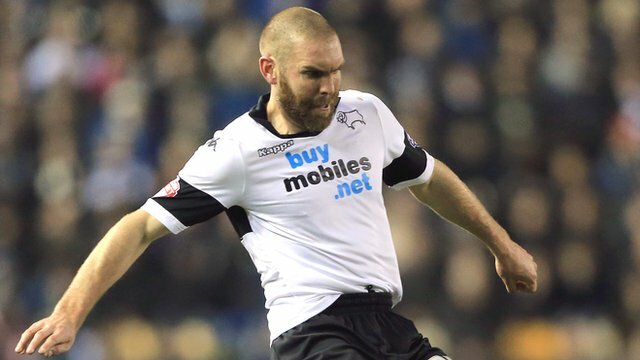 Jake Buxton arrived at Derby County from Burton Albion in 2009, following his manager Nigel Clough in transferring from the Brewers to the Rams. Given that Derby had not long been relegated from the Premier League and Burton had only just been promoted to the Football League, the signing was met with widespread incredulity – but Clough had faith in Buxton to make the jump, based on his work ethic and character. Clough was big on character. In the same way that his father would have no truck with ‘sh..houses’, Nigel prioritised and was loyal to men that he could trust. Buxton proved to be worthy of Clough’s faith. He is not tall for a centre back, nor is he particularly quick. He is, however, rabidly competitive, blessed with a street fighter’s determination and not above using a few of the ‘dark arts’, at times. Raised in the lower leagues, he loves to fight for every ball. It would be unfair to write him off as a rudimentary clogger, because he can pass, but it’s undeniable that his game is based on the simple core virtues of ‘heading and kicking it’, to quote Clough. Buxton continued to play regularly under Steve McClaren, who also extended Buxton’s contract. He was a key member of the side which reached the play-off final in 2013/4, but that season proved to be his peak at Derby, with injuries and the arrival of Jason Shackell reducing him to the role of bit-part player in the past two seasons. This is the right time for Buxton to move on from Derby, but at 31, he has plenty of time left. And a cursory scan of Twitter will reveal the real affection most Rams fans have for ‘Bucko’, who will be missed by all of us. Wigan Athletic have announced the signing of 24 year old Dan Burn. The 6 ft 7 in central defender was out of contract with Fulham. Dan Burn was born in Blyth but came up through the youth ranks at Darlington, making his first team debut at the age of 17. He went on to make 14 appearances for the north east club before moving to Fulham in the summer of 2011 for a fee of around £350,000. In September 2012 Burn went on an initial short term loan to Yeovil, but the loan period was to be extended to the end of the season. He made 41 appearances for the League 1 side, scoring three goals. Burn was to be sent off on another loan in July 2013, this time to Championship club, Birmingham City. He made 28 appearances for the Blues, scoring one goal, before being recalled to Fulham in January 2014. He made his debut for the Londoners on January 4th 2014 in an FA Cup tie at Norwich. Burn went on to make a total of 69 appearances for Fulham scoring two goals. Your fanzine editor asked on a Fulham Supporters website about Dan Burn and a view on him. I am a Fulham supporter of many years going back to the days of our legend Johnny Haynes (Fulham and England captain) and been part of the roller coaster ride during those years, so no Johnny Come Lately! I watch every Fulham 1st team home game, a few aways and every home U21 and U18 game, so I have seen a lot of Dan Burn. Dan is a product of the North East and came to us from Darlington. He is about 6’ 6” tall and has always played centre back for us. He is left footed and, unsurprisingly, prefers to play left centre back. He had 2 loan spells at Birmingham and Yeovil respectively. I don’t know about his Yeovil experience but the Birmingham management thought well of him and were interested in extending his loan at the time with a view to signing him. Dan is full of enthusiasm and has admirable leadership qualities but only in respect of drive and determination. He is said to train hard. He takes the game seriously and nobody could ever accuse him of not giving 100% in every game. This alone made him popular with many Fulham supporters. He is physically strong which is what you expect in a centre back. However, some of his decision making is questionable and if players run at him his legs buckle with fast jinky players, as his reading of those situations is poor and he is often left floundering on his backside. His aerial ability is somewhat mixed. From a defensive point of view he is strong in the air at defending crosses but often he does not get good purchase on the ball and in some situations the ball seems to loop of the top of his forehead when it needs to be powered away. This rather poor technique can be attributed to the fact that, like some tall players, he does not jump highly and has probably never had to at junior levels because of his height. This puts him at a disadvantage if a forward builds up a head of steam on the run and can either rise above him or equal his height. He should have scored more goals from set pieces but the same heading restrictions impede that part of his game too. I always thought that Dan would benefit from better coaching because unless he is a slow learner – and I have no reason to believe that – he could improve a lot on his technique and decision making. However, Fulham have not been blessed with decent coaching since the destructive Magath arrived and decimated our club, Kit Symons followed but was not allowed experienced coaching staff, having to make do with U21 coaches (NB: A big step up without a mix of 1st team experienced coaches). We now have some decent 1st team coaches but they obviously don’t fancy Dan. Whilst I have never met Dan, everyone Fulham fan that has likes him immensely. One thing that I do know is that when he signed the Wigan contract he will be genuinely devoted to the cause and not be false in the usual footballers speak of ‘great to be here’. If he sad that he would mean it and give all for the cause. I genuinely wish him all the best in his career and I hope that he is a late developer who will prove some people wrong. Hope this insight helps. Good luck with the new season.